John Wathen is the Creekkeeper for Hurricane Creek. In March 2012, he took some time out of his day to talk to Alina Coryell and her kids about his experiences in caring for the watershed. What follows includes a few short excerpts from a long conversation (which we hope to share in its entirety soon). John, what would you say is the most satisfying part of your job as a local waterkeeper? Getting to work with kids and people who are just beginning to take an interest in the creek. Seeing people awaken for the first time and watching their faces light up is amazing. Last year was not an easy year for our community. How would you describe your darkest moment as a Creekkeeper? April 28th, 2011. The moment when I first looked down and saw the magnitude of what was lost. It was difficult to want to stay. I couldn't wrap my mind around it. All the locals were shaken to the core. I promised Jimmy Watson I would take care of Watson's Bend if he'd let me. That promise made it easier for me to start looking for constructive actions- it gave me a reason to do things instead of feeling overwhelmed. You mention "doing things". What sort of things have you done in the past year since the tornado? We cleared the creek and let the community know that it is safe for use. Thanks to all the volunteer help, canoes can hit the water this spring. We also had the opportunity to reward businesses for good stewardship and best management practices. During the recovery, we were able to highlight an eco-conscious recovery process and learn what good stewardship involves in the context of natural disaster. The reputation of FOHC made businesses want to work with us, and we want to continue to offer incentives and encouragements to businesses seeking to leave a green footprint in their work. We also worked daily with various construction companies to assist them implementing practices for erosion control. Of course, we learned a lot in the process. You spend a LOT of time in the watershed and have the opportunity to encounter local wildlife. Your photos of creek "residents" are simply beautiful. Off the top of your head, name a few of your favorite local "residents" whom you've had the opportunity to meet. (John laughs). That's a hard one because there are so many. Let's see, I love watching the deer, the beavers, the raccoons, and the turkeys, each active in a certain way at a certain time of the year. They have their own clocks and calendars. Among the plants, the wild azaleas and the big leaf magnolias.... and the mountain laurels. Kids love the blueberries, huckleberries, and mulberries that they can eat straight from the bush. Steering in a different direction, what songs remind your of the creek or bring the creek to mind? I'll settle for give. 1. "Southern Smoke- Cold Steele" with music and vocals by John Wathen. The creek lives in that song. 2. Also, driving around the creek area, "Country Roads" by John Denver comes to mind. 3. "Black Water" by the Doobie Brothers. 4. Johnny Cash's "Folsom Prison Blues" has a train part that reminds me of the railroad bridge in Holt. 5. "My Home is in Alabama" by Alabama. That one speaks for itself. So how does it feel to be named one of 3 international River Heroes of 2011 by the Waterkeeper Alliance? (Some of us can't wait to see your speech in Portland. There's an irony in Alabama-goes-to-Portland.) It is one of the highest honors awarded to a waterkeeper. Humbling, inspired, Honored to even be mentioned by the world's water advocates, let alone be selected as a hero by my peers. I remember a great photo of you being published when you won the Locust Fork News-Journal Person of the Year Award back in 2009. You don't talk about this sort of thing often, but I'm curious. Have you won other awards or acclaims over the years as a creekkeeper? But none of these awards mean as much as seeing more and new fish in the creek every year. You have a tattoo on your arm inspired by the creek. How did you choose it and what does it mean? 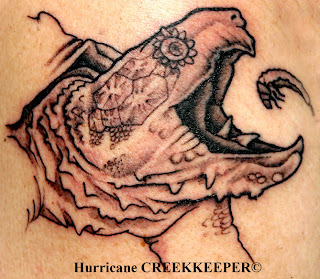 My tattoo includes an Alligator Snapper turtle and a Cadysfly larva. The top and the bottom of the food chain in Hurricane Creek. I stand to protect them and all the creatures in between as Hurricane Creekkeeper. Finally, what motivates you when the going gets tough? What motivates me is right here. Hurricane Creek is the Southern-most free flowing stream in Appalachia which gives it a very diverse and unique ecosystem including a collection of flora and fauna that is matched only on the Tibetan Plateau. This makes it one of a kind and in demand for protection and preservation. 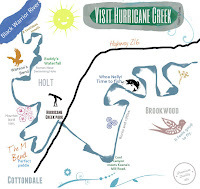 Friends of Hurricane Creek are the only ones who can do that by advocacy and education. 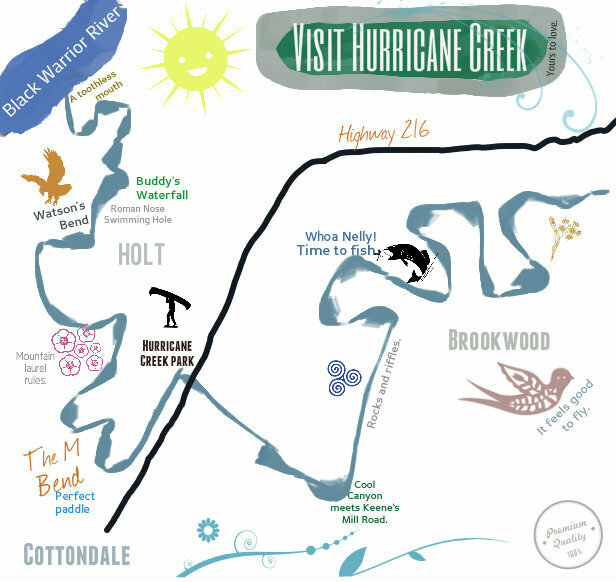 John and his dog, Queenie, took time to share the latest on Hurricane Creek. John after he explained where Hurricane Creek got its name. "Each of these trees is a story- a book about a life". John explains what the rings in the wood tell us about the life of the tree. "You see this line around the trunk?" John describes how this area was used in the past. Cadysfly larvae- the top and the bottom of the creek food chain.